What is a Residential Lease?A Residential Lease is a legally binding contract between a Landlord and tenant. The Lease gives a tenant the right to use and enjoy the described residential property in exchange for money. It outlines the rights and responsibilities of both the Landlord and Tenant during the tenancy. Governments have enacted laws to protect tenants by ensuring them a minimum set of rights. A Residential Lease cannot take away these basic rights. When should I use a residential lease?A written lease should be used whenever property is being rented out. 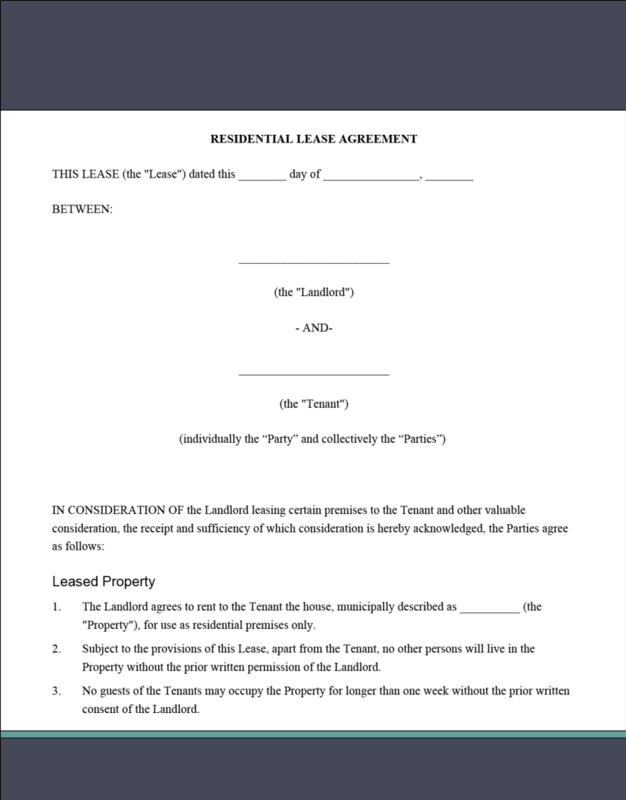 The lease reduces the potential for disputes by clearly outlining the responsibilities of both the Tenant and Landlord. LawDepot's Residential Lease was researched and prepared by lawyers to ensure its legal accuracy and our proprietary software makes it easy for you to customize the lease to your situation.What is a basement suite and how does this differ from renting a room?A basement suite is a self-contained dwelling unit with its own kitchen, bathroom, and living area. They often feature a private entrance to the house for the Tenant. The Landlord agrees to rent to the Tenant the house, municipally described as ______________________, ______________________, Alabama __________ (the "Property"), for use as residential premises only. The Tenant will pay the Rent on or before the ____________________ of each and every month of the term of this Lease to the Landlord at ______________________, ______________, __________ or at such other place as the Landlord may later designate by cash or check. This Lease will be construed in accordance with and exclusively governed by the laws of the State of Alabama. The Tenant will be charged an additional amount of $25 for each N.S.F. check or checks returned by the Tenant's financial institution. IN WITNESS WHEREOF _________________________ and _________________________ have duly affixed their signatures on this 19th day of April, 2019.